This attractive Red, White & Blue Linen Patriotic Ribbon accented with stars is ideal for patriotic decorating. Perfect wreaths, crafts & floral arrangements. 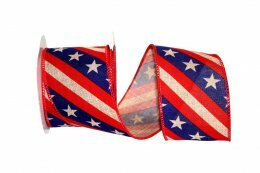 The wired edge on the Patriotic Ribbon makes it ideal to work with. There is something for everyone with our large selection Patriotic Ribbon, we are sure you won't be disappointed.